I worship Govinda, the primeval Lord, who is adept in playing on His flute, with blooming eyes like lotus petals with head decked with peacock's feather, with the figure of beauty tinged with the hue of blue clouds, and His unique loveliness charming millions of Cupids. 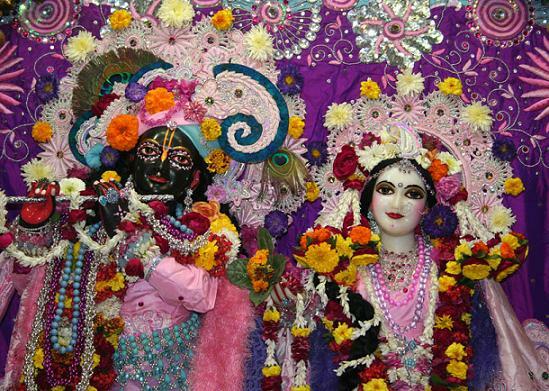 The matchless beauty of Krishna, the Supreme Lord of Goloka, is being described. Krishna, the all-pervading cognition, has a spiritual form of His own. The form of Krishna is not a fanciful creation of imagination formed after visualizing the beautiful things of the world. What Brahma saw in his ecstatic trance of pure devotion, is being described. Krishna is engaged in playing upon His flute. That flute by his enchanting musical sound attracts the hearts of all living beings. Just as a lotus petal produces a pleasant sight, so the two beautiful eyes of Krishna who causes the manifestation of our spiritual vision, display the unlimited splendor and beauty of His moonlike face. The loveliness that adorns His head with peacock feather figures, the corresponding feature of the spiritual beauty of Krishna. Just as a mass of blue clouds offers a specifically soothing, pleasant view, the complexion of Krishna is analogously tinged with a spiritual dark-blue color. The beauty and loveliness of Krishna is far more enchanting that that of Cupid multiplied a millionfold.